Straightpoint has launched a new product for measuring tension on static lines—the Clamp On Line Tensionmeter (or COLT) – with a state-of-the-art Bluetooth load monitoring app among a myriad of standout features. The COLT measures tension on wire rope up to 5,000 kgf (kg force) and up to 25 mm diameter. It clamps onto pre-tensioned wire ropes, eliminating the need for additional sheaves or tooling, as is the case with alternative solutions. An integral Bluetooth module, meanwhile, transmits tension data wirelessly to any smart device running the Android or iOS app that also contains an infinite wire rope library. Tension in wire ropes can be measured and logged within a few seconds. Wire ropes are complex; composition, size, construction, type of core and lay all need to be considered. A 1 x 7 rope behaves differently to a 7 x 19 or 6 x 36 rope; even wire ropes of the same diameter will calibrate differently because of varying rigidity. 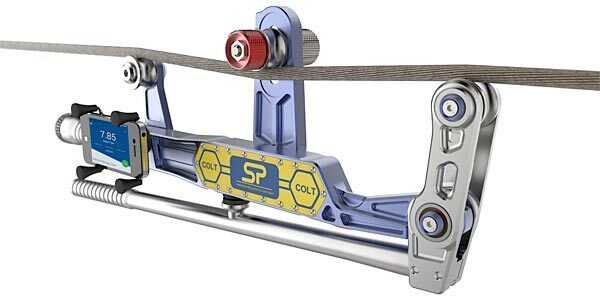 End users will leverage the hardware and software benefits of the COLT to simplify tension-measuring applications beyond what was previously thought possible. The COLT features a computer numerical control (CNC) machined aluminium construction with high precision roller bearing pivot; high leverage tensioning arm; auto-locking magnetic handle mechanism for security when installed; and IP67 / NEMA6 waterproofing rating. Typical applications will include tower and stack guy wires; pretensioned cable barriers; bridges; elevators; winch rope; overhead electric transit wires; fall arrest systems; aircraft cables; and utilities. It is expected to be most widely utilised in North American markets and will be officially unveiled at the Nation Association of Tower Erectors (NATE) annual conference, which takes place 27 February-2 March in Fort Worth, Texas. However, it will be consumed in other geographies and is available through Straightpoint’s global dealer network.